Narda Lepes is a well-known Argentinian Chef, presenter and author of several books. Her easy, modern and practical cuisine presents cooking as a relaxing and fun activity. Narda presents and participates in different TV programs, and also promotes her cuisine in her books, focusing on well-being and healthy lifestyles. She took part in several cooking events in Argentina, where Neolith was selected as the main material for preparation surfaces, including Feria Masticar 2015, and the cookery classes at the prestigious hotel of Rosario, Ros Tower. Narda also demonstrated the extraordinary technical features of Neolith kitchen worktops in videos, preparing several of her recipes directly on the material. 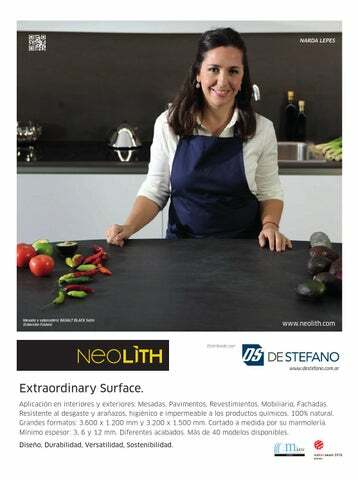 Neolith will also be integrated into her next local gastronomic project. Apple dessert cooked on Neolith counter top: 100% recyclable, natural and resistant to high temperatures! NEOLITH: Design, Durability, Versatility, Sustainability.